We’re proud to announce the release of our new line of 375ml Farm to Barrel beers. 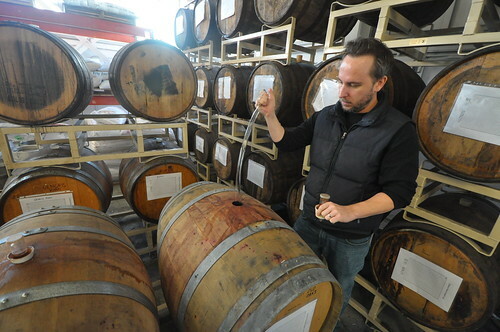 Since Almanac’s very beginning we’ve worked hard at developing an epic barrel-aging program. Simply put: we are infatuated with barrel aging. Oak aged beers are some of the most exciting and flavorful brews out there. Drawing inspiration from the sour beers of Belgium and bourbon barrels of the American South, oak aging offers a slower, more complex, and ultimately more rewarding way to craft unique flavors and aromas that can’t be created any other way. It also offers us the chance to work with smaller, more specialized harvests of fruit from our favorite local farms. As we’ve brewed our various beers over the past eighteen months, we’ve regularly stashed away beer in what is now an impressive collection of 250 various wine and spirits barrels. We check on each barrel regularly and wait for just the right time to say, “ready”. After more than a year of waiting, we are thrilled to release the first three beers in our new 375ml Farm to Barrel Series. Our first California wild ale is brewed with a blend of Cabernet & Muscat Grapes from Alfieri Farms, Concord grapes from Hamada Farms and plums from Twin Girls Farm—all located in the fertile San Joaquin Valley. Aged for over a year in used wine barrels, this sour ale blends rich flavors of the 2011 autumn harvest with farmhouse funk. Enjoy with aromatic Taleggio cheese and rich duck confit. This barrel-aged ale is a celebration of the California autumn harvest. Brewed with heirloom pumpkins from La Tercera Farms in Bodega Bay, crisp Fuyu persimmons from Hamada Farms in the San Joaquin Valley and fresh ginger from the Santa Clara Valley, then aged for over a year in white wine barrels to create a deliciously complex wild ale. Enjoy with delicate white fish and roasted squash.